In high school I was never assigned the novels CATCH-22, CATCHER IN THE RYE, TO KILL A MOCKINGBIRD, or LORD OF THE FLIES. So I never read them. I remember reading some Dostoevsky, THE GREAT GATSBY, a lot of Shakespeare, and THE WORLD ACCORDING TO GARP. The program I was in was advanced–and it was the seventies. Academia was making stuff up as it went along. Maybe the curriculum writers thought that the above-mentioned books were too commercial? Too un-literary? How odd. They were certainly good enough for the regular students. At the time I remember feeling a little superior for not being required to read those books. Funny. Now the whole distinction seems absurd. There’s no reason the other classes shouldn’t have been reading more Shakespeare than Romeo and Juliet. And now that I’ve read LORD OF THE FLIES, I feel like I was robbed. Allegory–as in (forgive me for this, fellow Christians) PILGRIM’S PROGRESS–can be dull stuff. I like my allegory unrecognizable and entertaining. That’s the only way it works. Lord save us all from stick-thumping morality tales. Yes, they’re fine for the youngest children. Take THE POKY LITTLE PUPPY, in which the puppy who spends all his time messing around and not paying attention to the puppy schedule doesn’t get dessert. (Sadly, it didn’t make much of an impression on me as a child.) Now there’s a good and useful story. LORD OF THE FLIES is certainly allegory. William Golding said as much. Were the curriculum writers thinking that the regular kids were better suited to or only prepared to understand easily-identifiable allegory? Isn’t all fiction, at some level, allegory for the way we are? From the first paragraph, I was immediately immersed in LORD OF THE FLIES. Because I’d never read it, or the Cliffs Notes version (which is what many of my friends read), I wasn’t thinking about the Garden of Eden as Golding wrote of the delights of the island. I wasn’t thinking of Jack’s red hair and his unpleasant visage as representative of human weakness and potential evil. I certainly wasn’t thinking of Simon as Jesus. I was just sucked into the story, feeling just the way I did the first time I read JANE EYRE and TREASURE ISLAND–as though there was no other story in the world in that moment. Nothing else mattered. As a writer I’m drawn to the simplicity of Golding’s prose. But also as a writer I notice that he spends waaaaaaay too much time on the way Ralph pushes his hair out of his eyes, the color of palm tree shadows, and how grubby the boys are. As a reader…Oh! The the way the wind and the parachute animate the body/beast caught on the mountainside… It’s a vision of horror that touches me in a visceral place. When I heard it–I listened to the audio version narrated by Golding–I experienced a kind of deep, childish pleasure that is so rare and precious that I wouldn’t even want to experience it more than a few times in my life, lest it be cheapened. Perhaps I wasn’t meant to read this novel until now. Perhaps I wouldn’t have experienced that same pleasure back when I was fourteen. By the time I was fourteen, I was almost too distracted to be deeply affected by literature–I can only compare it to the way teenagers are often turned off by church and talk of God. They must leave it and be at their most skeptical for a while in order to look at it with mature, more discerning eyes when they’re adults. Goldman does a wonderful intro to the audio, talking about the origins of the novel and why he wrote about boys instead of girls. And here’s a link to a Times U.K. online piece about the most recent Goldman biography. It’s definitely worth a look if you like to know how a book comes about. If you haven’t read LORD OF THE FLIES, I hope I haven’t spoiled it for you. If you have read it, you should definitely read it again. Education is taking yet another turn. In our high school, every grade level has to pick four novels, and all levels (general, advanced, and AP) read the same four novels. Honestly, I prefer the dialogue I have with my general kids much more than those I have with my advanced kids. They see the bare bones of the story, the inner workings of motivation. My advanced kids are too busy looking for the literary devices they’ve been taught. They are too wrapped up in the novel as a piece of work instead of as a story, an experience, a journey. 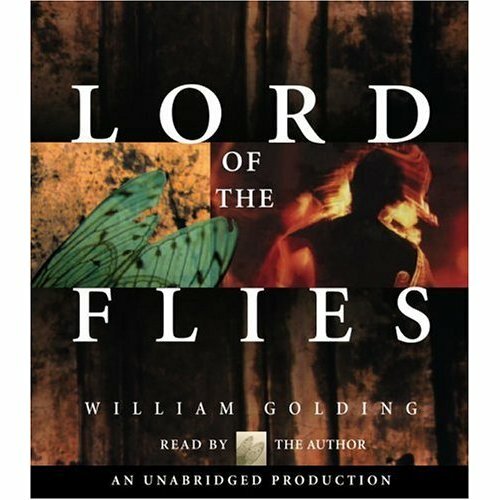 I have not read LotF (or LotR for that matter) and feel I’m kind of jaded about the story with all I’ve heard of it. I might have to give it a try one of these days, tho. Always liked this one — I read it when my last boyfriend taught at a prep school in Grosse Pointe. I pretty much read whatever he brought home so it helped make up for my weak high school training. We read Jonathan Livingston Seagull in BRITISH literature. Seriously. Even I knew something wasn’t right and I couldn’t blame the Neil Diamond songtrack we always had to listen to each day of that week. (Not that I have anything against Richard Bach — he was very nice to my dad when they met at a small airport years ago and my dad left thinking that all writers were deeply kind and charming — good work, Richard! Made my career choice seem less weird.) Hope you’re having a good weekend, honey! Nikaya-It’s sad that the advanced kids have lost the joy of the stories. Hope they’ll find it later. How cool that they all read the same books. Carrie-Long, yes, lol! I know what you mean about the memory of it. It’s a book that hangs with a girl–especially when one reads it with friends. Branda-How did the girls like it? Did they listen, or do they watch movies and play? I just never could get into TKAM. Though I appreciate books so much more when I listen to them. Definitely remember them better. When Nora was was little we started listening to Jeeves. She really got a kick out of them. Indigo-I’m so glad it inspired you. I bet you’ll see so much that’s new in the novel when you go back. I came to the conclusion that I was robbed, so when I was in my 20s and 30s, I read a lot of classics, including this one. I, too, was ignorant of those symbols, but tore through the book nevertheless. Still need to read the other books on your list. Have you read Steinbeck? I’ve read most of his novels. I read it a few years back and loved it. It wasn’t in our curriculum – from memory in high school I read Jane Eyre (an all time favourite), One Flew Over the Cuckoo’s Nest and Shakespeare. I know there were more but can’t remember them now. Tia–I don’t know what Beowulf translation we read, but I had no concept of what a brilliant story it is until I read Seamus Heaney’s translation about 10 years ago. Steinbeck is on my terminally long Classics TBR list. Pinckney actually won the first Steinbeck Prize back in the early 1990s for his novel DOGS OF GOD. We got to go to the Ambassador’s residence in London & everything–was sooooo glad no one there quizzed me on Steinbeck! Danielle–Oh, I just saw the Kubrick One Flew Over the Cuckoo’s Nest a couple of months ago. Loved it. I should definitely read the book. So glad to hear you’re another JANE EYRE fan. Loveitloveitloveit!